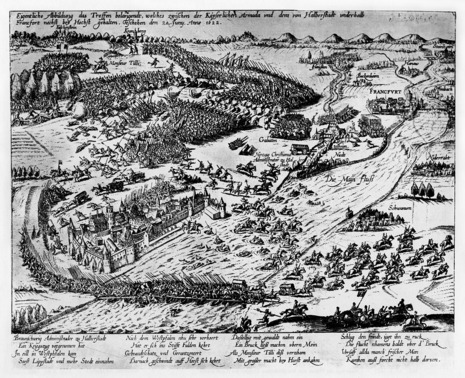 The Battle of Höchst was fought on June 20, 1622, between the combined army led by Johan Tzerclaes, Count of Tilly, and Gonzalo Fernández de Córdoba against Protestant forces led by Christian of Brunswick. It was a strategic Roman Catholic victory. On June 15, Christian reached the territory of theArchbishopric of Mainz at Oberursel. He sent Colonel von Kniephausen with an advance guard of 1,500 men against Höchst to take the town in a coup de main and to safeguard the Main crossing point. However, the Höchst municipal troups successfully defended the town. Kniephausen besieged Höchst. 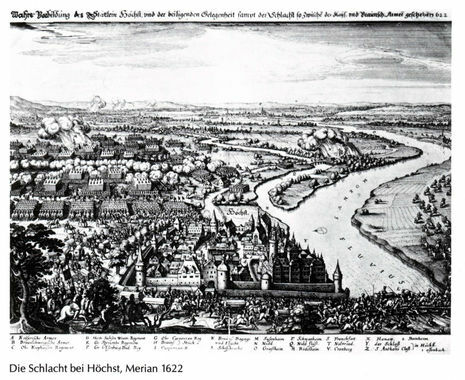 On June 16, Kniephausen's troops finally assaulted and plundered Höchst. Two days later the Protestants started building a pontoon bridge across the Main. Meanwhile Christian moved with his troops towards Höchst and destroyed the villages of Oberusel, Eschborn and Sulzbach. At the same time the Catholic troops approached in forced marches from Würzburg with 20,000 infantrymen, 6,000 cavalrymen and 18 guns. They arrived on June 19 at the Nidda River between Nied and Sossemheim late at night. When the bridge was completed in the morning of June 20, Christian's baggage started to cross the river. Christian formed his troups to fight the Catholics at Sossenheim. Meanwhile Tilly's troops were reinforced by an army under General Franz von Hövelberg, they could force Christian's troops back to the Höchst walls and the Main. 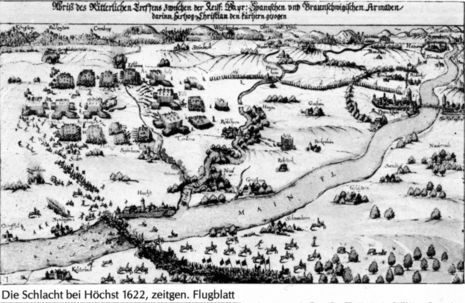 Hence, Christian ordered his troops to withdraw over the pontoon bridge towards Kelsterbach, but under the Catholic artillery fire the withdrawal turned into a headlong flight. The bridge broke and many of Christian's soldiers drowned in the Main. According to old chronicles, the Protestants lost more lansquenets from drowning than in the battle itself. Christian's entire baggage train and guns became Catholics loot. While the League troops lost only 100 soldiers, nearly 2,000 of Christian's soldiers died. However, Christian succeeded in escaping with 3,000 cavalrymen, 8,000 infantrymen, his war chest and eventually united with Mansfeld's army.